Texas Speaker's Race - Pledge tradition must come to an end... TODAY! A funny tradition has been uncovered in Texas in association with the race for Speaker of the House in the Texas Legislature. That tradition being the signing of a pledge of support to the outgoing speaker at the end of the prior session. This is a tradition that needs to stop, and it needs to stop TODAY! Much was made about the evil practice of voting for bills before there is time to read them. Every day we are learning about things in the new ObamaCare bill that was clearly passed without being properly read and understood by those we elected to vote on these measures. We find the US Attorney General filing a lawsuit against the state of Arizona when he hadn't even bothered to read the 10 page bill he was "opposing". But what we are doing in Texas is even worse. Members of the Legislature are committing to vote for a speaker before we even know who will be interested in running for Speaker. This is not like voting for a bill without reading it. This is like voting for it before it is even written! Texans elected 99 Republicans to the Texas Legislature. This is an overwhelming majority. Clearly the electorate is seeking Conservative leadership in the Texas House. Conservative candidates like Ken Paxton have thrown their hat in the ring to become speaker and more may follow. The next Speaker needs to be elected by the Republican Caucus of the State Legislature. Those 99 Republicans should have the opportunity to meet, debate and vote on who they want to lead them and their bills through the upcoming legislative session. 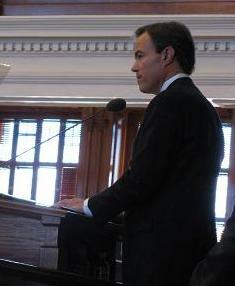 Speaker Straus should do the honorable thing here and release his pledge's and call for a caucus meeting. He would enter the caucus meeting much stronger for having done so. The time for voting for bills without reading them has ended. So too should be the practice of pledging to a speaker before all the choices are known. May God Bless Texas and the New Conservative Legislature! This conservative stands fully behind Straus. He is the man for the job... he worked under Regan... what more can you ask for! I will be demanding that my rep votes Straus. Texans want their voices heard! This "tradition" has expired! Grassroots Texans carried the day in November, and we will continue to make our voices heard, starting now with selection of our next Speaker of the House. Forget this old tradition - it has expired. The GOP's new 99-51 majority means that the GOP get's to pick their own leader - period. Thank you Joe Straus, but every reason suggesting why you may have been the best choice in 2009 (77/73) means that you are probably too moderate for 2011. The honorable thing for Strus to do is exactly what Bob Price suggests: Release your expired pledges, call for a caucus, and make your best case as to why you think you'd be the best GOP leader for 2011. Texas grassroots conservatives demand a GOP caucus - let's get it going!